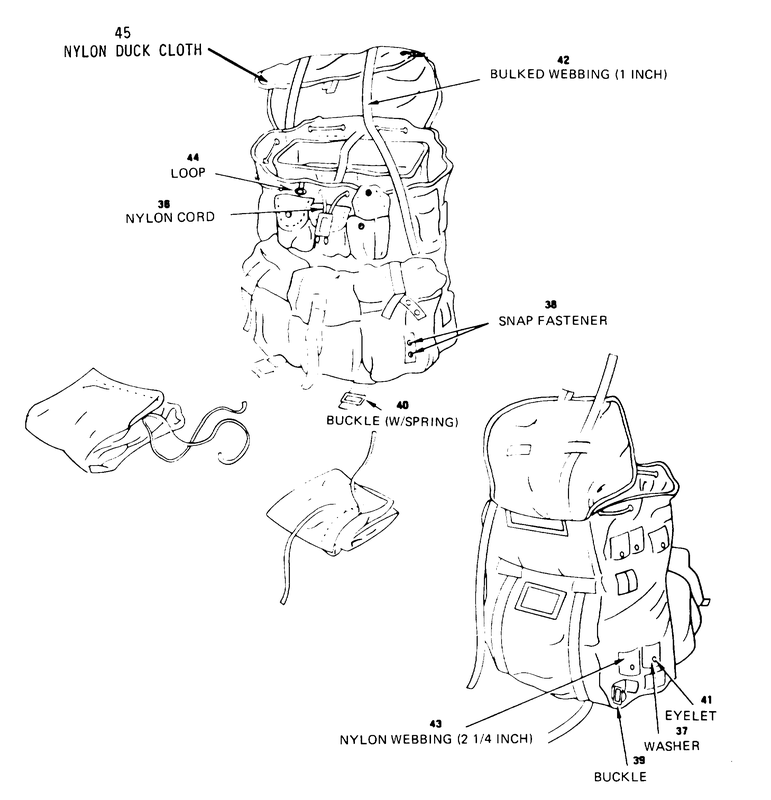 The field pack consists of a pouch with drawcord closure and three outside pockets. Three more smaller pockets are provided at the top of the pouch for carrying ammunition. Of the three lower outside pockets, the two outer ones are tunneled to the pouch so that long objects can be carried between the pouch and each pocket. The lower pockets have drawcords at the top for better sealing of the pocket before closing the flap. The pouch has a separate pocket to accommodate the AN/PRC-25 or 77 radio. Tiedown cords and D rings inside the pouch can be used to shorten the pack when it is not to be filled to capacity. The pouch flap has a pocket that can be opened by pulling two tabs apart. Small flat items can be carried in this pocket. Pressing flap sides together closes it. Hangers are also provided for carrying individual equipment. The field pack is carried on the soldiers back by attaching to the pack frame. Different-sized waterproof liners are available for the pouch and the lower outside pockets.